Home / Posts Tagged "Martyrdom"
Question 642: Can you please let us know the Brief Biography of Imam Ali bin Musa al-Ridha / Imam Ali al-Reza peace be upon him with reliance on trustworthy sources? Thanks in advance. Answer 642: Imam Ali ibn Musa al-Reza (A.S.), the eighth Shi’ite Holy Imam was born on 11th Zee al-Qa’adah 148 A.H. in the holy city of Medina. Question 254: I am having a query that we people do not know the exact date of our imams birthday or martyr as we knew imam al Mahdi (.a.s) is present? 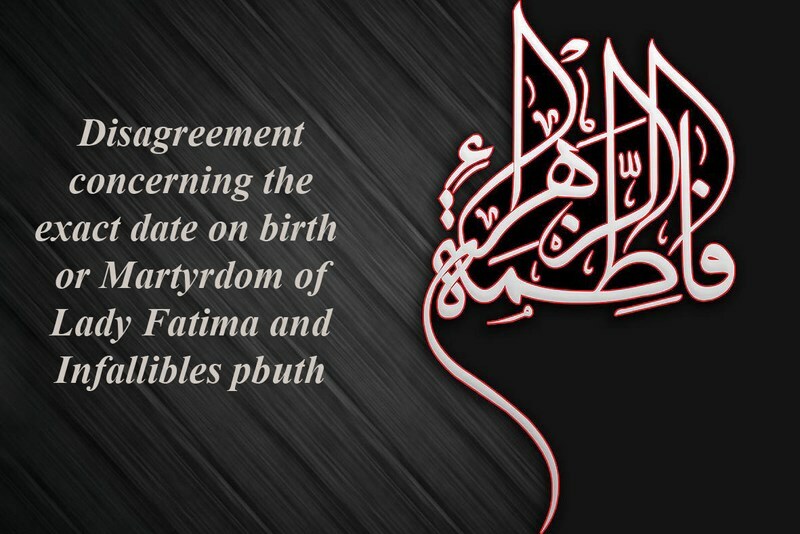 Example, the exact date on birth or Martyrdom of Lady Fatima (sa)? People didn’t narrate the historical events during the times of our Infallibles (pbuh) as we do, now. Due to lack of facilities, they didn’t keep such important issues on book or text to be transferred to the next generations. Narrating historical events were verbally at that times. Obviously, no one can claim that all of these narrators were immune to mistakes even about the date of birth of the Holy Prophet (pbuh) as we see different opinions in this regards. The people didn’t also record the date of birth of their children. Given to the fact that knowing the exact date of martyrdom or birth of our Infallibles (pbuth) was more important according to Shia narrators, most of scholars of this filed have been mentioned a solution by which people can understand it easily. They have been determined a date for such events based on the authenticity attained by scientific researches. There has been mentioned different opinions about how long has the Lady Fatimah (sa) been alive after the demise of the Holy Prophet (pbuh) in Hadithic or historical books. Some say it was forty days and others mentioned six months. According to Shia, the most authentic tradition in which mentioned the exact date of martyrdom of Lady Fatimah (sa) is a hadith narrated from Imam Sadiq (as) as He has said: Indeed, the date of martyrdom of Seddiqah Kubra (sa) is three months after the demise of the holy Prophet (pbuh). According to Tabarsi (ra) Hadhrat Seddiqah Tahirah (sa) has passed away in Jumada al-Akhira in the eleventh year of the hegira. She had lived 95 days after the demise of the holy Prophet (pbuh). In his book Dalael al-Imamah Late Tabari narrated a hadith from Imam Sadiq as He has said: Lady Fatima Zahra (sa) has passed away on Tuesday in the month of Jumada al-Akhira, in the eleventh year of the hegira. Most of shia scholars including Sayyid bin Tawoos have accepted these above mentioned ahatith as authentic. There is another sahih hadith narrated by Late Kuleini from Imam Sadiq (as) as He has said: Indeed, Lady Fatima (sa) were alive seventy five days after her beloved Father (pbuh). Probably, the reason why some of scholars say it was ninety five days and others say seventy five days after the Prophet’s (pbuh) death is that the punctuation wasn’t prevalent at that time. Taking the following words into consideration can confirm the reason. If we delete the spot of the letter “B” in the word “sab­’ôn” (seventy) and add two spots above the first letter of the word it would be pronounced “Tes­’ôn” (ninety). Note: According to great Shia scholars, the most authentic date of martyrdom of Lady Fatima Zahra (sa) is ninety five days after the Prophet’s (pbuh) death.
 . Majlesi, Muhammad Baqir, Bihar al-Anwar, Vol. 43, Pg. 189, H 19.
 . Abul Faraj Esfehani, Maqatel al-Talebin, researcher: Saqar, Sayyid Ahmad, Pgs. 59 and 60, Dar al-Marefat, Beirut, Bita.
 . Tabarsi, Fadl bin Hasan, Aalam al-Wara bi Aalam al-Huda, Vol. 1, Pg. 300, Aalul Bayt Institution, Qom, first edition, 1417 A.H.
 . Tabari, Muhammad bin Jurayr bin Rostam, Dalael al-Imama, Pg. 79, Be’that, Qom, first edition, 1413 A.H.
 . Ibn Tawoos, Ali bin Musa, al-Iqbal bi al-Aamal al-Hasana fima Ya’mal Marrat-an fi al-Sunna, researcher and editor: Qayoumi Esfahani, Jawad, Vol. 3, Pgs. 160-161, Daftar Tablighat Islami, Qom, first edition.
 . Al-Kafi, Vol. 1, Pg. 458, H 1.
 . Adopted from answer 8086.